Strabismus is a misalignment of the eyes. It is sometimes referred to as “crossed eyes” or “eye turn” and can result in the eyes turning either inward toward each other, outward away from each other or in an upward or downward direction. There is often one dominant eye in which the vision strength is normal and brain-to-eye connections are intact. The less dominant, or weaker, eye is usually vision-impaired (see page on Amblyopia). Strabismus may also exist where one eye is focusing while the other is turned in but the turned in eye can alternate between eyes. In this case Amblyopia does not develop but depth perception suffers as the brain cannot use both eyes at the same time. Strabismus may be quite apparent when looking at someone who has the condition or it may only be noticeable occasionally. What can make the eye turn more noticeable is if the person has focused on a particular object, if they stop paying attention to anything in particular, if they are ill, or if their eyes are fatigued such as at the end of the day. When treated early, Strabismus may be correctable, but if left untreated, it may cause permanent visual impairment such as blurred vision, double vision or problems with depth perception. It may also cause difficulty in social situations where the eye turn is noticeable and attracts attention to the deficiency. What Causes Strabismus in Infants? Strabismus in infants and toddlers can be caused by a variety of factors. It may be genetically passed down from someone in the family or it could be the result of illness, medical conditions, eye injuries, brain trauma, or in some cases unknown. Strabismus can also be caused by high amounts of uncorrected Hyperopia (farsightedness). Children who develop the condition are usually diagnosed between the ages of 1 and 4 years old. Dr. Timothy Moore is a highly knowledgeable, experienced and award winning pediatric vision provider. As a father of four and frequent volunteer leader in various children’s organizations, Dr. Moore is passionate about caring for and protecting vision in children of all ages. He takes this responsibility very seriously and one of his main goals is to help educate parents on how to build healthy eye care habits that will set their children up for maintaining good vision for life. 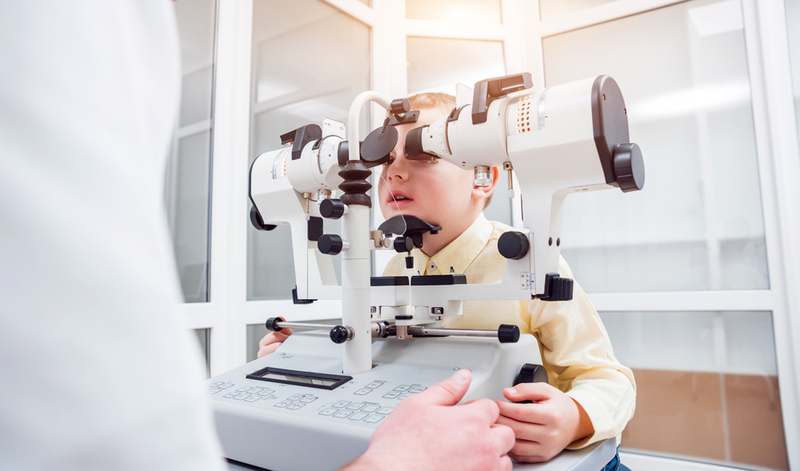 If you suspect that your child may have Strabismus, Dr. Moore can provide a thorough exam and help organize a treatment plan to get your child’s vision back on track as soon as possible. Early detection is a major factor in being able to correct vision problems caused by Strabismus. Strabismus frequently comes along with a condition called Amblyopia or “Lazy Eye” which Dr. Moore addresses first. Amblyopia is typically treated with an eye patch over the “strong” or better seeing eye as well as less invasive, options such as vision therapy or red lens patching. See our page on amblyopia for more information. The main treatment that Dr. Moore recommends for strabismus varies but often vision therapy is used, a sequence of eye training activities (similar to occupational therapy) that help teach the brain to align the eye and use both eyes together. Another common treatment for strabismus is eye muscle surgery. This surgery is performed by a pediatric ophthalmologist where the muscle is shortened or moved in order to align the eyes. For best results Dr Moore recommends vision therapy afterwards to teach the brain how to use the newly aligned eye. Dr Moore is very familiar with strabismus surgery procedures and works closely with families who have had children go through surgery to achieve the best vision results possible. When you are ready to take your child in for an eye exam, whether for an infant or toddler, you want to make sure that you are getting the best care possible. Proper eye care is essential maintenance to help ensure your child’s healthy growth and development. Especially in children who can’t tell you they have a vision problem. Vision is something that many people tend to take for granted, as long as no problems are present. But just like eating nutritiously and exercising regularly are important for maintaining a healthy body, regular vision checks can make a huge difference in a child’s overall well-being. Not only can they help detect the presence of debilitating eye conditions but they can also be the first step in detecting other health issues, such as diabetes, vitamin deficiencies or brain tumors. We welcome interest and questions from new patients. Visit the New Patient Center on our website to learn more about what we do at Epic Vision Development, to get information about insurance options and to save time by filling out any necessary paperwork before you come into our office for a visit. Our blog and newsletter contain a wide variety of informative articles that help our patients learn more about healthy eye care and routine maintenance. Give us a call today and we’ll be happy to set you up with an appointment at your earliest convenience. We look forward to welcoming you into our practice and providing quality eye care for you and your whole family!